Businesses that use Microsoft’s Skype for Business communication product have some new beta features to play with that make the enterprise messaging and calling product more useful. The features, which were first announced earlier this year when Microsoft officially rebranded its Lync service as Skype for Business, allow businesses to create large-scale meetings and better integrate Skype for Business with traditional phone lines. It’s all designed to make the service more appealing for enterprises when those features enter general availability later this year. 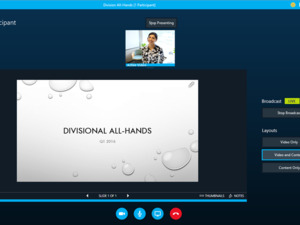 Skype Meeting Broadcast is designed to make large meetings possible over the Internet. A set of meeting organizers can broadcast a video feed of their meeting from Skype for Business to up to 10,000 other participants. Those who aren’t speakers can watch the proceedings from most web browsers, without using a plugin. The system also integrates Yammer and Bing Pulse so that speakers can collect and respond to live back-channel feedback in real time. The feature is built for “town hall” style meetings or webinars that feature a few speakers who want to talk with a large number of recipients. Prior to the launch of Skype Meeting Broadcast, meetings through the service were capped at 250 participants. Because it’s based on Azure’s media streaming technology, which powered NBC’s online streaming of content from the Winter Olympics, Meeting Broadcast has the potential to grow and power larger meetings in the future. 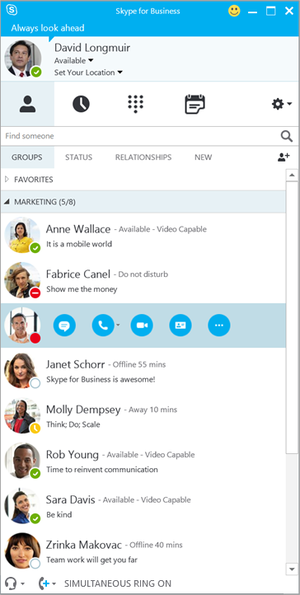 In addition to the high-tech communication service, the update also brings new previews of two services designed to make Skype for Business work with good old fashioned telephones. A new PSTN Conferencing feature allows people to call into Skype for Business meetings using a traditional telephone, and allow people who are in those meetings to dial out to phone users. Haberkorn said that the feature was designed for situations where using a computer would be impractical or unsafe, like when a caller was on a slow Internet connection or doing something that they shouldn’t be distracted from, like driving. It’s similar to a feature offered by Citrix’s GoToMeeting product, which also allows users to call in to a digital meeting from a standard phone. Microsoft also revealed a Cloud PBX service that will allow people to make and receive traditional phone calls inside Skype for Business. Users will be able to hold, resume, forward and transfer their calls from the app as well. A future update will also add support for using on-premises phone lines. Microsoft’s Lync Server product already offers similar capabilities in an on-premises environment, but this is the first time Microsoft is extending them to the cloud. Right now, the services are only available as a beta for businesses with a subscription to Office 365 enterprise or Skype for Business Plan 2, though Microsoft plans to roll them out more broadly later this year. The Cloud PBX and PSTN Conferencing features are currently only available to users in the U.S., while Skype Meeting broadcast can be used worldwide. Those businesses that want to take advantage of the new services can choose to deploy any number of them, as well. Companies that rely on Skype for Business (or plan to) will be able to use Azure ExpressRoute for Office 365 later this year to get a direct connection from their business to Microsoft’s servers, which should improve call quality for an additional cost.